The common cold most often causes a runny nose, nasal congestion, and sneezing. You may also have a sore throat, cough, headache, or other symptoms. It is called the common cold for good reason. There are over one billion colds in the United States each year. You and your children will probably have more colds than any other type of illness. People are most contagious for the first 2 to 3 days of a cold. A cold is most often not contagious after the first week. Is It a Cold or Allergy? The correct answer is either one. Colds have similar symptoms to allergic rhinitis, a type of allergy that affects the nose. Common triggers of allergic rhinitis include dust and pollen. To figure out whether your stuffy nose comes from a cold or allergies, think about when your symptoms began. The correct answer is a few seconds or minutes. If you breathe in something you're allergic to, your body releases a chemical called histamine. This quickly triggers allergy symptoms, such as watery eyes or a runny nose. Using an antihistamine can help reduce allergy symptoms. The correct answer is 2-3 days. You can catch a cold if: • A person with a cold sneezes, coughs, or blows their nose near you. • You touch your nose, eyes, or mouth after touching something coated with a cold virus, such as a doorknob. You can help prevent colds by washing your hands or using a hand sanitizer often. Having aches, pains, or a fever means you probably have a cold, not allergies. The correct answer is true. Allergies don't cause achiness or fever. Adults and older children with colds most often have a low fever or no fever. Young children with a cold often run a fever around 100-102°F. Acetaminophen (Tylenol) or ibuprofen (Advil, Motrin) can help lower a fever. Never give aspirin to children. People with more severe allergies may feel tired. If you have a cough or your throat hurts, you must have a cold. The correct answer is false. Either a cold or allergies can cause cough and a sore throat. Try hard candy or lozenges to ease a sore throat and calm a cough. Avoid using lozenges in children under age 3. The correct answer is 1 week. If you still feel sick after 7 days, see your doctor to rule out a sinus infection, allergies, or other medical problem. Antibiotics can help treat a cold, but not allergies. The correct answer is false. Antibiotics only kill bacteria, not viruses. Colds are caused by viruses, and allergies are caused by allergens. This means antibiotics will not work against colds or allergies. Over-the-counter (OTC) cold medicines can help ease cold symptoms. Don't use any OTC cold remedies in children under age 6. Which can trigger an asthma attack? The correct answer is either one. If you have asthma, a cold or allergies can make it worse. Use your rescue inhaler as prescribed if you begin wheezing. Colds are the most common trigger of asthma symptoms in children. If asthma medicine doesn't help, call your doctor. A thick yellow or green nasal discharge is normal with a cold. The correct answer is true. The fluid from your runny nose will become thicker and may turn yellow or green within a few days. This is normal and does not mean that you need antibiotics. Drinking plenty of fluids can help. If discharge doesn't go away in 10 - 14 days, call your doctor. The correct answer is colds. There are over one billion colds in the United States each year. You and your children will likely have more colds than any other type of illness. Getting plenty of sleep, eating healthy foods, getting plenty of exercise, and not smoking can all help keep your immune system strong and keep you healthier. Adults and older children with colds generally have a low fever or no fever. Young children often run a fever around 100°F to 102°F (37.7°C to 38.8°C). Over-the-counter (OTC) cold and cough medicines may help ease symptoms in adults and older children. They do not make your cold go away faster, but can help you feel better. These OTC medicines are not recommended for children under age 4. Many alternative treatments have been tried for colds, such as vitamin C, zinc supplements, and echinacea. Talk to your health care provider before trying any herbs or supplements. The fluid from your runny nose will become thicker. It may turn yellow or green within a few days. This is normal, and not a reason for antibiotics. Most cold symptoms go away within a week in most cases. If you still feel sick after 7 days, see your provider. Your provider may check to rule out a sinus infection, allergies, or other medical problem. Otitis is a term for infection or inflammation of the ear. Eat yogurt that contains "active cultures." These may help prevent colds. Probiotics may help prevent colds in children. Allan GM, Arroll B. Prevention and treatment of the common cold: making sense of the evidence. CMAJ. 2014;186(3):190-199. PMID: 24468694 www.ncbi.nlm.nih.gov/pubmed/24468694. Avner JR. Fever. In: Selbst SM, ed. Pediatric Emergency Medicine Secrets. 3rd ed. Philadelphia, PA: Elsevier Saunders; 2015:chap 13. Centers for Disease Control and Prevention. Common colds: protect yourself and others. Updated February 6, 2016. Cdc.gov Web site. www.cdc.gov/Features/Rhinoviruses/index.html. Accessed February 1, 2017. Miller EK, Williams JV. The common cold. In: Kliegman RM, Stanton BF, St. Geme JW, Schor NF, eds. Nelson Textbook of Pediatrics. 20th ed. Philadelphia, PA: Elsevier; 2016:chap 379. Structures of the throat include the esophagus, trachea, epiglottis and tonsils. Colds are caused by a virus and can occur year-round. 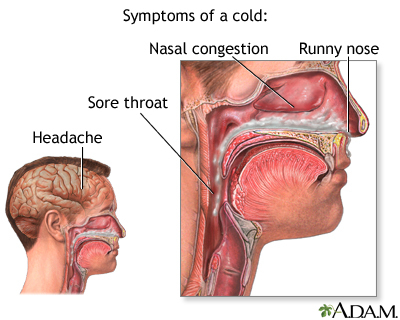 The common cold generally involves a runny nose, nasal congestion, and sneezing. Other symptoms include sore throat, cough, and headache. A cold usually lasts about 7 days, with perhaps a few lingering symptoms such as a cough for another week.